2. Since the first bi-monthly monetary policy statement of April 2014, global activity is evolving at different speeds. A broad-based strengthening of growth is gaining traction in the US and the UK, after a moderation in the first quarter of 2014 due to adverse weather conditions. However, in the euro area, recovery is struggling to gather momentum. The pick-up in sales in Japan in anticipation of the consumption tax hike has been followed by a sharp fall in consumer spending. Growth in coming quarters will depend on all three “arrows” being put in play. Structural constraints continue to impede growth prospects in emerging market economies (EMEs), with concerns about the slowdown in China as its economy rebalances. Financial markets across the world still remain vulnerable to news about the impending normalisation of interest rates in some developed economies, even as some valuations appear frothy. 3. Lead indicators point to continuing sluggishness in domestic economic activity in the first quarter of 2014-15. The outlook for agriculture is clouded by the meteorological department’s forecasts of a delay in the onset of the south-west monsoon with a 60 per cent chance of the occurrence of El Nino. The ongoing contraction in the production of consumer durables and capital goods, coupled with moderation in corporate sales and non-oil non-gold imports, is indicative of continuing weakness in both consumption and investment demand. The decisive election result, together with improved sentiment should, however, create a conducive environment for comprehensive policy actions and a revival in aggregate demand as well as a gradual recovery of growth during the course of the year. 4. Retail inflation measured by the consumer price index (CPI) increased for the second consecutive month in April, pushed up by a sharp spike in food inflation, especially in the prices of fruits, vegetables, sugar, pulses and milk. CPI inflation excluding food and fuel has moderated gradually since September 2013 although it is still elevated. 5. For the year 2013-14 as a whole, India’s current account deficit (CAD) narrowed sharply to 1.7 per cent of GDP, primarily on account of a decline in gold imports, although other non-oil imports also contracted with the weakening of domestic demand, and there was some pick-up in exports. In April 2014, the trade deficit narrowed sharply due to resumption of export growth after two consecutive months of decline, and the ongoing shrinking of import demand. Robust inflows of portfolio investment, supported by foreign direct investment and external commercial borrowings, kept external financing conditions comfortable and helped add to reserves. 6. With the unwinding of year-end window dressing, the corresponding decline in the size of excess CRR holding of banks as well as the sharp decline in Government cash balances with the Reserve Bank as a result of Government expenditure, liquidity conditions improved significantly in April and May 2014. The average daily access to liquidity from the LAF and term repos during this period has been close to 1.0 per cent of NDTL. The Reserve Bank will continue to monitor liquidity conditions and will actively manage liquidity to ensure adequate flow of credit to the productive sectors. 7. In March and April, CPI headline inflation has risen on the back of a sharp increase in food prices. Some of this price pressure will continue into May, but it is largely seasonal. Moreover, CPI inflation excluding food and fuel has been edging down. 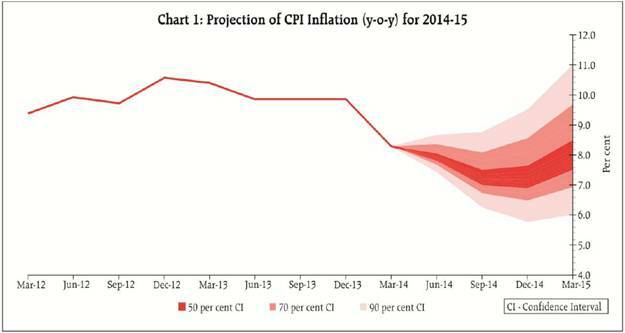 The risks to the central forecast of 8 per cent CPI inflation by January 2015 remain broadly balanced. Upside risks in the form of a sub-normal/delayed monsoon on account of possible El Nino effects, geo-political tensions and their impact on fuel prices, and uncertainties surrounding the setting of administered prices appear at this stage to be balanced by the possibility of stronger Government action on food supply and better fiscal consolidation as well as the pass through of recent exchange rate appreciation. Accordingly, at this juncture, it is appropriate to leave the policy rate unchanged, and to allow the disinflationary effects of rate increases undertaken during September 2013-January 2014 to mitigate inflationary pressures in the economy. 8. The Reserve Bank remains committed to keeping the economy on a disinflationary course, taking CPI inflation to 8 per cent by January 2015 and 6 per cent by January 2016. If the economy stays on this course, further policy tightening will not be warranted. On the other hand, if disinflation, adjusting for base effects, is faster than currently anticipated, it will provide headroom for an easing of the policy stance. 9. 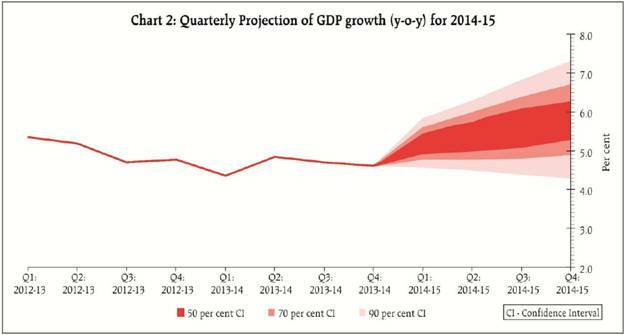 Contingent upon the desired inflation outcome, the April projection of real GDP growth from 4.7 per cent in 2013-14 to a range of 5 to 6 per cent in 2014-15 is retained with risks evenly balanced around the central estimate of 5.5 per cent (Chart 2). The outlook for the agricultural sector is contingent upon the timely arrival and spread of the monsoon. Easing of domestic supply bottlenecks and progress in the implementation of stalled projects should brighten the outlook for both manufacturing and services. The resumption of export growth is a positive development and as world trade gathers momentum, the prospects for exports should improve further. 10. In pursuance of the Dr. Urjit R. Patel Committee’s recommendation to move away from sector-specific refinance towards a more generalised provision of system liquidity without preferential access to any particular sector or entity, the Reserve Bank has decided to limit access to export credit refinance while compensating fully with a commensurate expansion of the market’s access to liquidity through a special term repo facility from the Reserve Bank (equivalent to 0.25 per cent of NDTL). This should improve access to liquidity from the Reserve Bank for the system as a whole without the procedural formalities relating to documentary evidence, authorisation and verification associated with the ECR. This should also improve the transmission of policy impulses across the interest rate spectrum and engender efficiency in cash/treasury management. 11. As the economy recovers, investment demand and the need for credit will pick up. To the extent that this contributes eventually to supply, it is important that banks have the room to finance it. A reduction in the required SLR will give banks more freedom to expand credit to the non-Government sector. However, the Reserve Bank is also cognisant of the significant on-going financing needs of the Government. Therefore, the SLR is reduced by 0.50 per cent of NDTL, with any further change dependent on the likely path of fiscal consolidation. 12. With a view to improving the depth and liquidity in the domestic foreign exchange market, it has been decided to allow foreign portfolio investors to participate in the domestic exchange traded currency derivatives market to the extent of their underlying exposures plus an additional US$ 10 million. Furthermore, it has also been decided to allow domestic entities similar access to the exchange traded currency derivatives market. Detailed operating guidelines will be issued separately. 13. As a prudential measure, the eligibility limit for foreign exchange remittances under the Liberalised Remittance Scheme (LRS) had been reduced to US$ 75,000 last year. In view of the recent stability in the foreign exchange market, it has been decided to enhance the eligible limit to US$ 125,000 without end use restrictions except for prohibited foreign exchange transactions such as margin trading, lottery and the like. Operating guidelines will be issued separately. 14. At present, only Indian residents are allowed to take Indian currency notes up to `10,000 out of the country. Non-residents visiting India are not permitted to take out any Indian currency notes while leaving the country. With a view to facilitating travel requirements of non-residents visiting India, it has been decided to allow all residents and non-residents except citizens of Pakistan and Bangladesh to take out Indian currency notes up to `25,000 while leaving the country. Operating guidelines in this regard are being issued separately. 15. The third bi-monthly monetary policy statement is scheduled on Tuesday, August 5, 2014.